It's been 5 years since hubby and I came back here in my homeland and started a ministry for the Lord. We started with 12 people and we held our Sunday services in our carport. We did it for a year until the Lord opened a door and we moved to a farming village where most of my distant kinfolks reside. We had our first VBS in 2010 and there were around 18 kids who attended. It was really a blessing to see those kids came to know the Lord Jesus Christ and there were 10 kids who got saved and baptized after VBS. Words could not expressed the joy I felt to see those kids saved. We then held Bible studies once a week with the kids and adults and then we started to have a Sunday worship services with God's leading. We rented a small bungalow house where we held our services. The adults used to have Sunday School underneath the mango tree while the kids were inside having their Sunday School. Now it's the other way around. When we have a full house, some of the people stay outside because the space is so limited. The Lord saw our need of a church building and we were able to purchase a piece of land after a year from our church fund. August last year when the church building construction began. My brother was the one who drew the building plan and I asked him to estimate the building materials needed. He's an architecture graduate and he's knowledgeable with that. I bet he's been reading a lot of BuildDirect reviews that's why he's always updated about the latest in building construction materials. The church building now is erected but it needs windows, doors and the flooring needs to be poured out. The walls need plastering too. The work has to be put on hold because of insufficient fund. We are raising money from people to help us finish our church building and so far, there were some who responded positively and hubby and I are so thankful. God is really good. We pray that the Lord will touch other people's heart to give so we can finish His house of worship soon. We want to finish the church auditorium before our VBS on April. Meanwhile, I am checking out the BuildDirect's Crunchbase page so I have an idea how much the building materials cost now. While contemporary lighting often equals nouveau styles and chic designs that feature distinct contemporary styling, the aesthetics of classic lighting designs are never out of date. The richness of traditional chandeliers in a foyer or dining room always adds a spark of chic and is sure to elicit the oohs and aahs that hostesses love to hear. Whether you choose a traditionally styled chandelier or one with more modern funk in it, a chandelier is always a great option for adding pizzazz to a room or area. Classic designs like teardrop prisms dangling from cast iron, or candle-shaped mini bulbs glistening on an old-fashioned wood chandelier are no less dynamic for their classic look. However, contemporary styling is also finding its way into the hearts and homes of Americans in the 21st century. Websites like Crescent Harbor Modern Lighting feature a host of exciting modern designs that incorporate the tradition of chandelier lighting with ultra-chic contemporary designs. Bright vibrant colors, provocative shapes and spectacular arrangements help create an exciting ambiance that candles cannot create. With the proper décor and a striking contemporary chandelier to highlight it all, the room is filled with a welcoming warmth. A chandelier, whether it is traditionally designed or not, can easily stand out as an eye-catching showpiece that will instantly enthrall guests and visitors. When considering lighting for that special room where guests will be entertained, think elegance, and look up. Refined elegance can easily share the table with funky chic and the results can be spectacular. I just love flowers and I'm always fascinated every time I see them. Ever since I was a kid, I was already in love with different kinds of flowers. I started planting roses in my garden when I was in grade school and until now that I'm a grown up adult I still have the passion of planting flowers in my garden. Here are some flowers that I planted and they are in bloom now. I have some kalachuchis, zinnias, bougainvilleas and euphorbias to name a few. My orchids are not yet in bloom. I can't help myself but got my camera and took some shots. I love photography and I'm trying to learn. I used my Nikon DSLR to take these photos. It's been a while since my hubby and I went on vacation. We've been so busy with our ministry. Life of a full time missionary can be rigorous. I remember, one of our most memorable vacations happened a few years ago. We went to a beach resort and rented a cottage there. We spent three days in that beach resort and we really enjoyed our vacation. We even met a German guy who happened to be renting the cottage next to us. I got the chance to talk to him and asked him some personal things about his life. He said that he works six months to earn money and spend the rest of the year traveling abroad. He was always on the go and always choose a destination to travel to Europe and Asia. 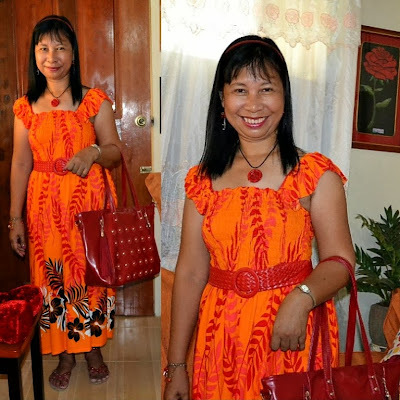 I learned that he has a Filipina girlfriend and was waiting on her to visit him in his cottage. 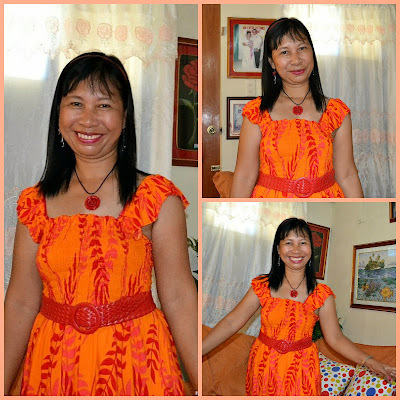 My hubby was listening to our conversation and he was smiling while I did my interview. He told me later on that I was just like a lady reporter who is very nosy about other people's private lives, lol! It's a good thing that German guy was jolly and he answered all my query. Now hubby wants to go on vacation again. We're hoping to do that after we can complete the construction of our church building. He wants to go to a beach resort where we spent our first wedding anniversary many years ago but I suggested to hubby that we should go on vacation to other places that we've never been before. Both of us love nature so we have to look for a suitable place to spend our next vacation where we can enjoy the quietness and just bask in the beauty of our scenic surroundings. We need to relax and unwind. Hope we can go on furlough before the year ends. Hubby and I celebrated Valentine's Day by dining out as we used to do. We went to try this restaurant called Hardin sa Paraiso located in Lelemaan, Manaoag. It was our first time to go there though we passed by it a few times before. I heard good reviews about it so I was curious and have to try it for myself. It was past 12 noon when hubby and I went there. Hubby parked the car and we're lucky that there was a vacant spot close to the gate. Upon entering the gate, we went down a few steps to a beautifully manicured garden. The nipa huts were all occupied so we went to their main dining hall and it was fully packed. The waiter gave us a seat. We waited until they came to give us a table. Hubby and I love the place. The main dining area is spacious and ideal for special occasions and events and is made of bamboo, wood and concrete, with a roof of cogon leaves and netting. The tree houses are small but ideal for couple on a romantic date. Families and friends would certainly enjoy dining in the nipa houses. The garden is neatly trimmed and looks like a small park. It has a delightful ambiance truly making you feel that you are in a "garden in paradise". The place is very ideal for photo shoot for people who love taking photos like me. Since I'm on a diet, I ordered the blue marlin loin steak, plain rice and fruit salad for dessert. Hubby ordered kare-kare, garlic rice and iced tea. Their prices are not really bad and the kare-kare with beef is good for 2 to 3 people. Our foods were served and the blue marlin is served with 2 slices only and a small bitty slice. I thought it was more than that. The taste is okay. The kare-kare is good for 2 to 3 people but the taste is not that good. We had better like the kare-kare from Matutina's and Deluxe restaurants. So we were both disappointed with that. Kare-kare is one of hubby's favorite Filipino foods along with fried squid and adobo that's why he likes to order that in the restaurants we've been to. We didn't eat all the kare-kare and I asked the waiter to put it in a doggie bag and when we went home, hubby gave it to my brother's dog. They gave us a red, heart-shaped box with half dozen chocolates as Valentine's Day give-away. The amount hubby paid was Php672.00 but we were not fully satisfied. I think I like the foods in Deluxe better and it's cheaper there too. The thing that we like about the Hardin sa Paraiso is the place and the garden view. Would I want to go back there? I definitely will. Hubby and I would want to try their other menus. Who knows, it would be a lot better than their kare-kare. 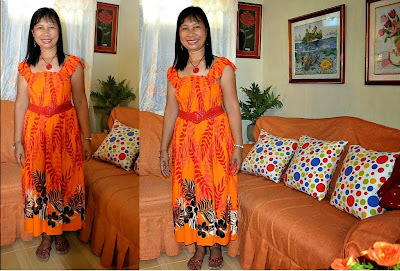 I love bright and flowery printed cotton dresses. I have quite a few collection and I love to wear them on a bright, warm, sunny day. I also wear it to church. 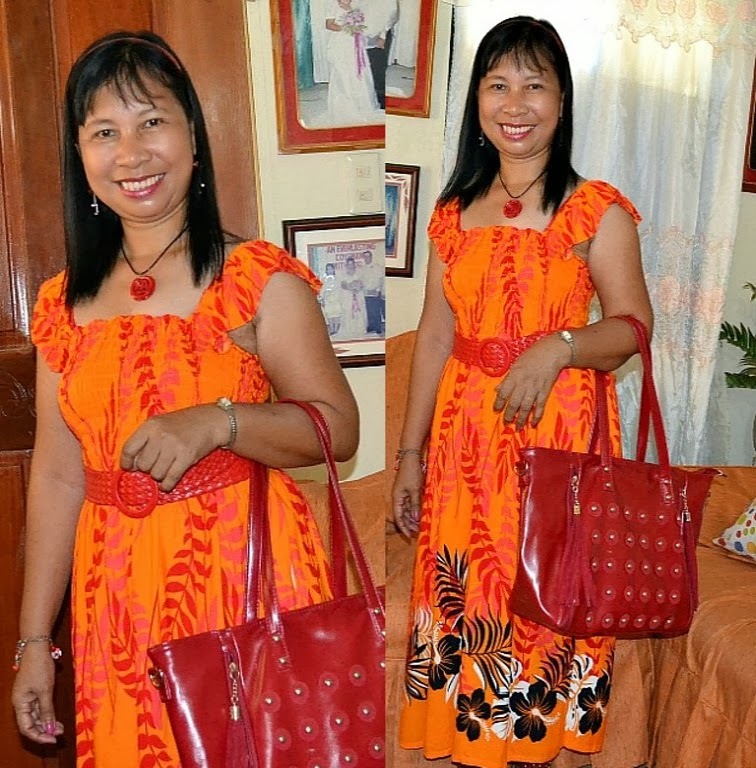 As I blogged here before, I always wear dress or skirt and blouse when I go to church. I want to look my best every time I go to God's house. This dress was given to me by a friend on Christmas the year before last. 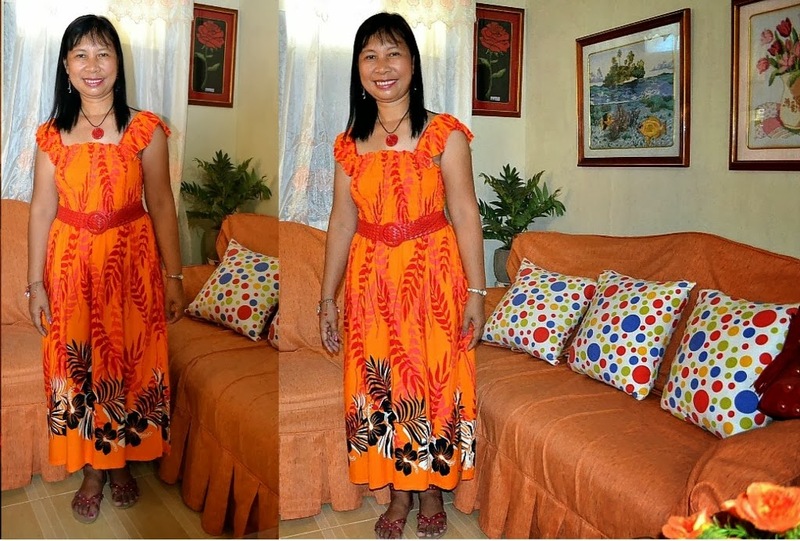 It's a bright orange with prints. It was my second time to wear it to church this morning. The fabric is made of cotton and it's soft and cool on my skin. I wore it with matching red belt, red necklace, red earrings, red bag and red sandals. I should wear this again on Valentine's day, lol! I'm not making a promise but I will try to post some of my outfits that I wear to church on Sundays. I've been stressed the past few weeks with all the hustle and bustle of life. Being a stay-at-home wife is not an easy job. I do most of the chores and it's so tiresome and sometimes boring. My fingers had been tingling and in pain and also my back maybe because of gout or arthritis. Sometimes I wish that I'm still working like I used to but if I think of getting up early and work 8 hours a day, 5 days a week, uh, uh, I better not. God blessed me and gave me a husband who can support me and I don't have to work for a living. Our work now is for the Lord and take care of the ministry that He entrusted to us. God is really good! I needed a treat for myself. What better way than to pamper myself and show myself some appreciation for all the works I've done. So I text my old time friend and asked her to do a home service for me. She came after lunch yesterday and gave me a hair spa. It's my first time to have this done in my hair. While waiting on my hair to be done, I asked her to give me a manicure. It's been a while since the last time I had my nails manicured by an expert manicurist. Most of the time I do it myself to save some money. I can tell the difference of her work and mine. My nails look a lot better. After she's done with my the hair spa, my hair looks shinier and smoother. Next, she gave me a whole body massage right in the comfort of our bedroom. She gave me a Swedish massage and it lasted for an hour. She learned how to massage from a German when she was working in Qatar. My stress was relieved and I felt so calm and relaxed. The pain in my back was relieved. I paid her Php100 for the hair spa, Php50 for my manicure and Php200 for the whole body massage, a total of Php350. Not bad for a home service huh! I don't have to spend a whole lot to pamper myself. I'll do it again next time. I deserve time to rest, relax and rejuvenate my body, mind and soul so I can work better for the glory of God. It's February once again folks and I noticed that time is flying by so fast. It seems like it's only been yesterday when we welcomed the New Year. Now another month has gone and in due time, another year will come. We need to enjoy every moment because life is short and wasted time is part of your life you will never get back. We need to spend our time wisely, as the saying goes "Time is gold". My time is usually spent doing house chores, church activities and blogging. Doing all these really occupies my time. House chores is so taxing to me because I'm having issues of gout in my fingers and the girl whose been helping me went back home. I need to find another helper to relieve my fingers from this gout. Hubby is not a great help. Yeah, he wash dishes and cook too but only once in a while. I do the work most of the time. It's no big deal to me if only the pain and tingling in my fingers will leave me.